Want to live (even) longer? We recently reported the finding that small amounts of glucose have a horrendous effect on the lifespan of the nematode worm C. elegans. 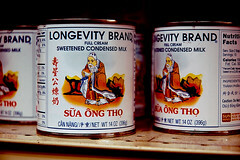 Another report has just been published which underlines the critical role of nutrition in longevity. Zhang and colleagues at the Mount Sinai School of Medicine, New York have reported that in two species (mice and C. elegans), a 30% reduction in daily calories extends lifespan significantly. This in itself is not news – considerable data has been generated showing that caloric restriction has a dramatically beneficial effect on lifespan and diseases of aging (e.g. cancer, diabetes). Caloric restriction doesn’t seem to depend on what type of nutrient is lowered – the total calorie count is key. The big finding here was that in two very different species (i.e. mammal and nemotode) the same genes were responsible for the extension of lifespan. The CREB-binding protein (CBP/cbp-1) gene was the key player – indeed, blocking the CBP gene switched off all the improvements to lifespan normally seen from limiting calories. Message: consume fewer calories (within healthy limits) if you want to live long and strong. In this aging economy, the above is just one of many studies that innovators will be interested in applying to the marketplace (e.g. designing CBP-modulating drugs). Want to know more about aging and the opportunities in this market? MaRS will soon be hosting the Business of Aging conference – a major multi-disciplinary symposium. Check it out and discover how you can position yourself in this burgeoning industry!